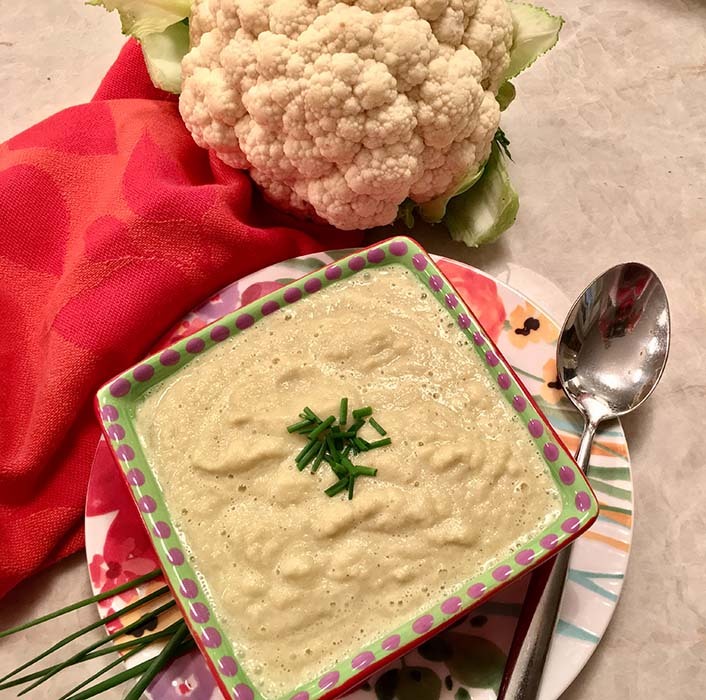 To all those cauliflower lovers…this dish can be served either as an entrée or a quick delicious side. We’re all so busy these days that simple and fast recipes have a value all their own, and this great dish can be pulled together in 15 minutes or less. It’s packed with nutrition, and very versatile – you can spice it up as much (or as little) as you like (see my “fun fact” below for some examples). Break apart the head of the cauliflower. Coarsely chop shallots, add garlic cloves, and sauté along with the cauliflower for 3 to 4 minutes in a little bit of olive oil (1 tablespoon-plus) until you begin to see the vegetables brighten. Transfer to blender and begin to add vegetable broth until you see the mixture start to be pureed. Salt and pepper to your liking. Cauliflower action, packed with great nutrition! Low in calories, loaded with vitamin C, folic acid, fiber, potassium, to mention just a few benefits - there's not enough space to list them all! Remember that not all cauliflower is white - you can mix it up, trying purple or green - it's all good! Add the spice and/or chopped herbs of your choice - some of my favorites are chives, turmeric, parsley and watercress.